I choose to breathe in the wonder of God's eternal love, And dance to the rhythm of eternal breath, Listening to the whispers calling me to slow down and take notice. I choose to absorb the beauty of the divine presence, to delight in the Creator of all things and relish the delight God takes in me. Can you imagine a God who dances with shouts of joy, laughs when you laugh, loves to play, enjoys life, and invites us to join the fun? Like many of us, Christine Sine had spent many years with an image of God who was "a very serious, workaholic type of God." And even when her theology told her this was not true, she struggled to live into this new way of thinking. What she needed was a childlike spirituality. In this book, Christine Sine, online host of the Godspace community, invites us to pay attention to childlike characteristics that have the power to reshape us. Each chapter addresses a childlike characteristic to embrace, including delight, playfulness, imagination, awe and wonder, love of nature, the ability to live in the present, and much more. Fresh spiritual practices that engage all our senses help us live a new spiritual life that embraces the wonder and joy that God intends for us. 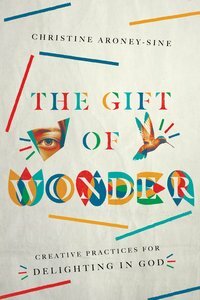 About "The Gift of Wonder"
Christine Aroney-Sine is an Australian physician who developed and directed the healthcare ministry for YWAMs Mercy Ships. She has a broad background in international health and travel medicine and has worked in Africa, Asia, Central America, the Caribbean and the South Pacific. She now lives in Seattle with her husband, author Tom Sine. They work together with Mustard Seed Associates assisting churches and Christian organizations to engage the challenges of the 21st Century.